Sienna Allen (kneeling, far left) is a standout for the 2026 West Virginia Thunder on the travel ball scene. Allen is a Portsmouth native. Fourth-grade basketball standout Sienna Allen, a member of the 2026 West Virginia Thunder girls basketball travel program, performed on a unit that placed in third out of 13 teams while playing in the fourth grade boys division in a Beckley, W. Va. tournament and second place in the All-Ohio Kickoff in Columbus, Ohio while playing up a grade level. Last weekend, Allen, with the 2026 Thunder, who won the Western Pennsylvania Bruins Tournament in Pittsburgh, Penn. in the fourth grade girls division. During their strong tournament run, the Thunder defeated its opponents by a margin of 180-34, including victories of 44-4, 42-8, and 33-1 in the opening three rounds. 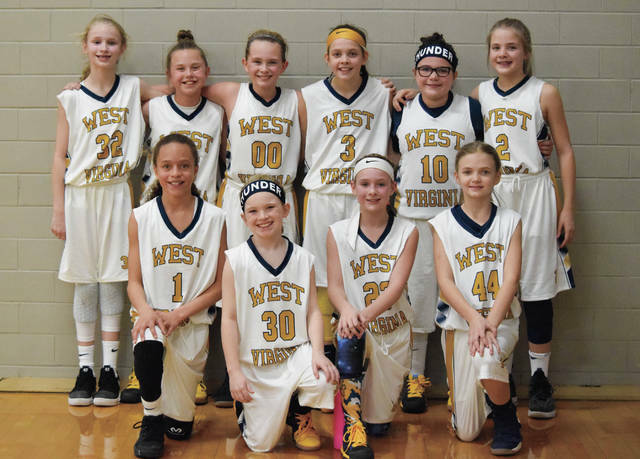 The 2026 Thunder then defeated the West Virginia Elite, 37-11, in the semifinals, then took down All-Ohio, 34-10, in the title contest to take home top honors of the eight teams that participated in the Bruins Tournament. The unit is coached by Chris Staten (head coach) and Bruce Morris (assistant coach). The girls will be competing in the next few months in Athens, Cincinnati, Pigeon Forge, Tenn. and then the AAU (Amateur Athletic Union) Nationals in Orlando, Fla. at the ESPN Wide World of Sports in July. The players include Allen, Fairland feeder system players Taegan Leep, Addyson Cornell, Addison Godby, and Bailey Russell, Chesapeake feeder system player Sophi Hutchison, and Coal Grove feeder system player Kendall Taylor, among others.